Please contact APEC directly at 1800-880-4808 if you need UV with 100V/220V voltage, thank you. Right from your kitchen tap! This complete reverse osmosis water filter will produce an unlimited supply of bottled-quality drinking water while removing any chlorine, unpleasant tastes, odors and up to 99% of harmful contaminants to produce clean and refreshing water that everyone will enjoy. This will improve the flavor of coffee, tea, and ice cubes—everything tastes better with RO water! Plus, it comes with a 100% metal & 100% lead-Free luxury designer faucet that sits next to your main faucet and makes your counter-top look great! With two decades of experience in reverse osmosis system design and production, our reverse osmosis systems have been proven to deliver the finest filtration and durability. This gold standard RO system guarantees the highest contaminant removal rates, giving you the purest water possible. Your health will never be compromised with a RO-Hi system. 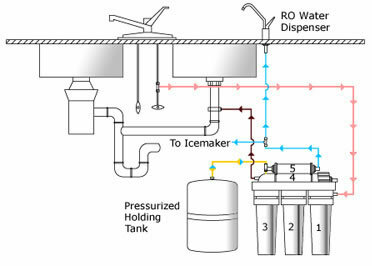 Upgraded quick dispense design for your RO system will greatly increase the flow rate of water from the tank to the faucet. The higher water flow will allow you to fill up a glass or pitcher of water 2X faster. Reduces wait time when drawing and filling large pots of water for making soups or beverages. RO-Hi uses only top-rated, US-made filters, like the industry leading Dow Filmtec Membrane, resulting in complete water purification not available from basic filters. Our super-capacity filters deliver 2X the capacity AND service life of other brands while the membrane provides the highest rejection capability and durability. Enjoy the longest-lasting performance and low maintenance with these industry-leading filters! RO-Hi is made with simple installation and maintenance in mind. It is equipped with quick connection fittings and colored tubing, which make system installation and maintenance extremely fast and easy. Easy to install and low maintenance: save homeowners up to $1,029 or more a year + time and hassle from buying costly, heavy bottled water. Fully scalable and upgradeable making it a great investment for a growing family.